Forget Amazon Echo-style voice controls or touchscreen gestures; controlling a computer with your thoughts is the ultimate way to interface with machines. There’s just one problem: for the technology to work as well as it could, it might be necessary to drill a hole in your head and insert a chip in your brain. That, as they say in the trade, is a dealbreaker. A New York startup called CTRL-Labs has a different idea, though. Founded by Thomas Reardon, the creator of Microsoft Internet Explorer, it describes itself as an “applied research neuroscience company” with designs on decoding your neural activity. But unlike many of its rivals in this space it won’t actually venture too close to your cranium to do it. And it certainly won’t be brandishing any drills or other cutting implements. Carry out feats like typing 200 words-per-minute without physically touching a keyboard. Instead, CTRL-Labs has developed an electronic wristband that promises to make possible non-invasive mental control of computers, smart prosthetics, and a range of other devices. This brain-computer interface uses the voltage bursts that result from contractions in the arm’s muscle fibers. By analyzing these signals, slight body movements can be transformed into computer inputs. Better still, as the video below makes clear, even the intention of movement can be read as movement. Admittedly, this isn’t a brain-computer interface in the way that we might think of one. The team describes it this way because it may be the fastest means yet of turning the brain’s conscious instructions into useful actions. In this case, the technology becomes a natural extension of thought and movement. 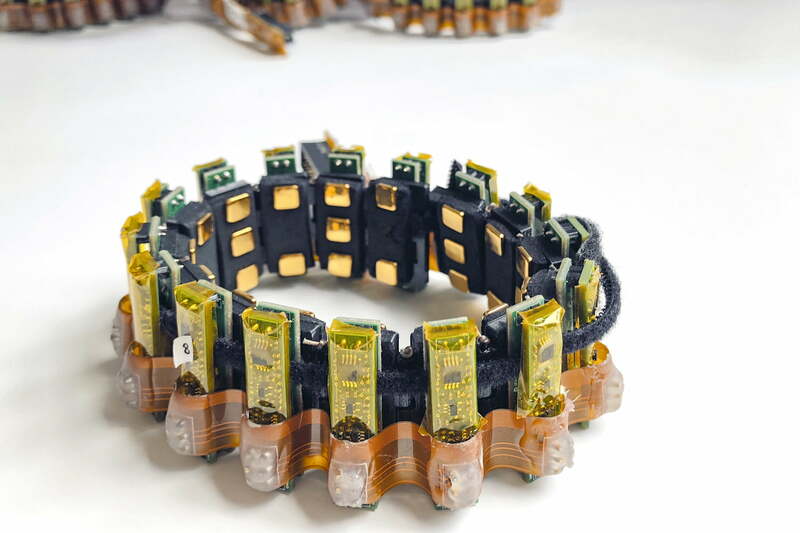 Using CTRL-Labs’ prototype device — which looks a bit like the studded armband a 1990s superhero drawn by Rob Liefeld might have sported — users can carry out feats like typing 200 words-per-minute without having to physically touch a keyboard. Also Read: Worried about the eavesdropping bug? A new universal input device? A subtle gesture, on the other hand, can be carried out in virtually any context. It’s also a very versatile control method. Our hands turn out to be pretty handy hunks of meat. We can type with them. We can hold pens with them. We can drum our fingers. We can ball our fingers up and form fists. The ability to recognize any of these gestures using one ultra-sensitive wearable could lead to the biggest leap forward in computer interfaces since the invention of the mouse. It could be even more versatile, in fact, since the mouse is really only an analog for pointing; transforming that one universal human gesture into a computational metaphor. He suggested that it could prove to be a generational thing, in which our CTRL-Labs armband-wearing kids view today’s input devices the same way they skeptically look at bits of retrograde tech detritus like VHS tapes and Game Boys. “Did you guys seriously used to use those?” they’ll ask us, one hand subtly contorting as they simultaneously gesture out a quick IM to their school friends. Using CTRL-Labs’ technology, the idea of controller-free VR suddenly becomes a whole lot more possible. As the world becomes increasingly “smart,” with connected Internet of Things devices all around us, it’s equally easy to imagine how technology such as this could be used to let us interact with everything from our smart thermostats to our smart locks. What self-respecting geek hasn’t, at some point, wished that they could control the world around them with a simple Jedi Knight-style wave of the hand? Such things may not remain science fiction for too much longer. The bigger question, however, is how this will translate to other interface methods. Some gestures are natural to us, like pointing at an object to indicate interest. Others, like American Sign Language, have more of a learning curve. We can train ourselves to use them as second nature — much like a pianist learns to turn the music in their brain into finger movements on a keyboard — but this requires effort. We’ll get the chance to find out soon. We await the verdict with bated breath, arm muscle fibers twitching with excitement.